It’s fitting that the monk parakeet is green. It is, after all, an alien bird. Or maybe that depends on who you ask. Non-native or “introduced” species like the monk parakeet, European starling, rock pigeon and house sparrow are despised by a lot of birders. They’re regarded as illegal immigrants, or worse. I’ve heard pigeons called rats with wings. Sky carp. Falcon food. But whatever your opinion of them, non-native birds are here to stay. We might as well accept them and—dare I say it?—enjoy them. I confess that last spring I caught myself admiring a starling. The bird was on the ground, warming itself in the sun on a chilly morning. From my angle, the rainbow effect on its iridescent plumage was striking. Monk parakeets are showy in a different way, and most of us are still getting to know them. This South American species gained a Chicago foothold in the 1970s, probably when a few pet birds were released into the wild. Their local population has been growing ever since. Think of the monk as a parrot, not a parakeet. It’s a sizeable, conspicuous bird. Author Pete Dunne likens it to a bright green American kestrel, but with a longer, pointier tail. Monk parakeets live in noisy colonies characterized by enormous stick nests, often constructed on power line towers. The nest clusters—a headache for ComEd—are so dense (and the birds so hardy) that monk parakeets survive here year-round. Like many area birders, I saw my first monk parakeet in the Hyde Park neighborhood of Chicago, home of the region’s original colony. 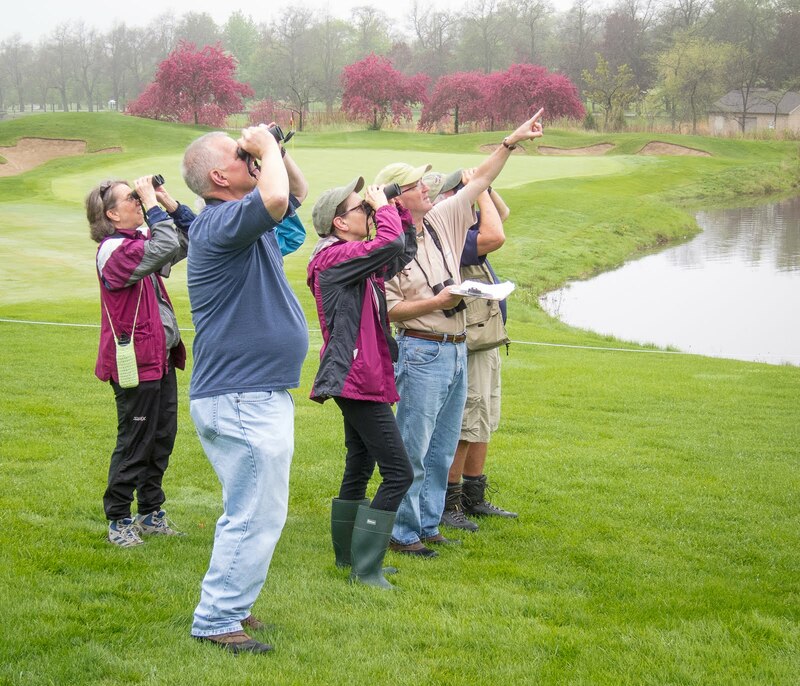 The birds are easily found just south of the Science and Industry Museum—look for their nests on the light poles at the golf course driving range. Last year, following a tip, I set out to see my first monk parakeets in DuPage County. I found them at Cricket Creek Forest Preserve in Addison. The best vantage point was actually from outside the preserve, from the southbound on-ramp to Route 83 off Lake Street. Their massive nest on the utility tower is impossible to miss. Monk parakeets will visit backyard feeding stations, but be careful what you wish for. The birds travel in groups and have voracious appetites. They can empty a feeder faster than a flock of grackles, and watch your ornamental fruit trees too! They’d be welcome in my yard, though, just for the color and excitement. Another expanding non-native species to look for is the Eurasian collared-dove. This bird looks just like a mourning dove but has a thin black band or “collar” behind its head. I see these birds every time I visit South Florida but their distribution is now well beyond the Southeast and moving north. They are commonly sighted in Illinois counties south of here, so I’ve started looking at the mourning doves in my yard a lot more carefully. Maybe I’m thinking about non-native species a bit more these days because of a newly published book that I received for Christmas: “Pigeons: The Fascinating Saga of the World’s Most Revered and Reviled Bird.” I’m looking forward to it. Really. Learning more about the common birds around us, including the non-natives, is a worthy goal. Be curious and keep an open mind. It’ll help you enjoy the hobby even more.